You are currently browsing the category archive for the ‘Noncanonicals’ category. My view of how art history is assembled and canonized was changed inexorably after seeing Pacific Standard Time in Los Angeles last fall. * The Getty’s outrageously ambitious and sensationally successful mega-exhibit about Southern California art between 1945-1980 featured 1300 artists at over 200 museums and art galleries. Many if not most of these 1300 practitioners lived and worked on the West Coast, living under the radar of what was then an extremely New York-centric art world. The fact that they were not included in the canonical history of art during that era was not due to a lack of talent. It was more a lack of proximity, and a lack of likemindedness with the tastemakers and art insiders of the time. So now, post PST, I have more of an eye and a nose for unsung artists in that immensity of art, for those who missed out in the “narrowing and ordering of the historicizing process” for whatever reason. This kind of artistic resuscitation is nothing new. The most famous case of a willed reassessment is probably Lawrence Weschler‘s “Shapinsky’s Karma” (which appears as a chapter in his book, A Wanderer in the Perfect City), the extraordinary account of one man’s campaign in a pre-Internet art world to bring visibility to a talented but unknown contemporary of Pollock and Rothko. My project is more personal. Highly so. I started writing down the name of artists, many of them deceased, whose work I did not know but spoke to me deeply. As the list kept growing it needed a name. The Noncanonicals seemed to capture their outsider spirt with a slight twist of the defiance that many of them possessed during their lives. Some of the artists on my list are from the West, but plenty spent their lives in New York as well. A high percentage of them are, not surprisingly, female. What started out as a little sidebar activity has now grown into something much richer than I would have guessed. I have been surprised by the joy of discovery. Sharing these finds here on Slow Muse makes sense since many of us share a similar sensibility. Some of you will already know the artists I am highlighting even though they are new to me. Please share your stories and insights. In many ways this could and should be a Wikiproject, the art version of a community garden for previously forgotten heirloom plants. 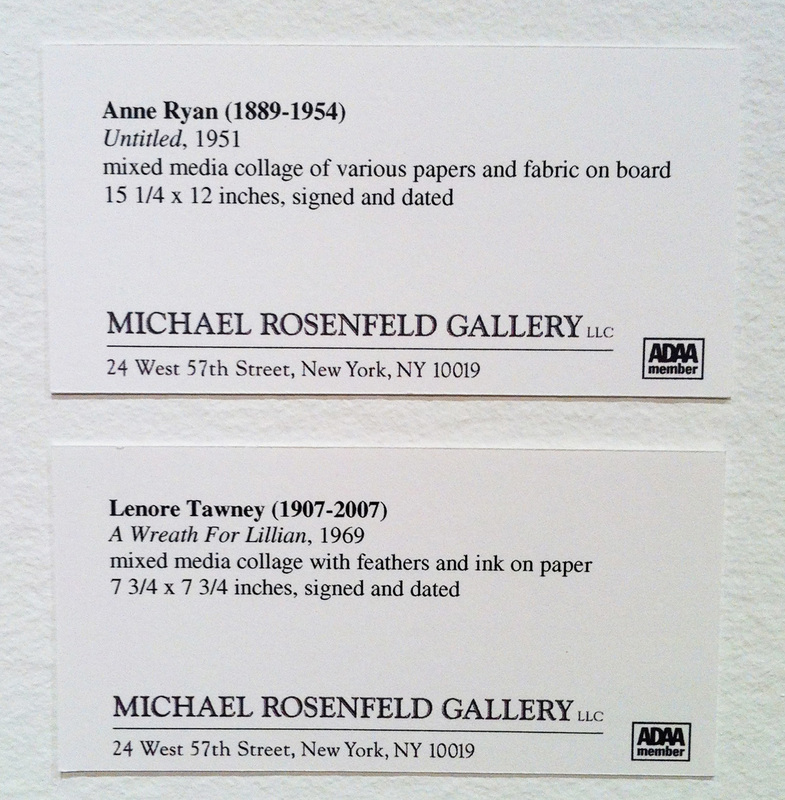 My offering today is two artists I found at the “On Paper” show at the Michael Rosenfeld Gallery in New York this weekend: Anne Ryan and Lenore Tawney. 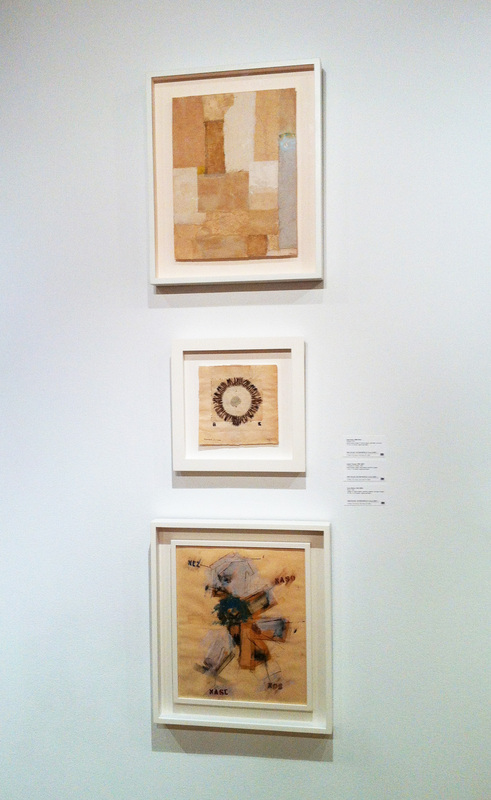 Ryan and Tawney’s small works were on display alongside a Larry Rivers piece. They held their own. The juxtaposition with Rivers, a high visibility art world star, is a poignant reminder of just how many great ones slipped by, under noticed and under appreciated. Here’s some background on each of them. Ryan was a poet, journalist, chef and artist. Leaving her marriage in 1923, she ran a restaurant in Greenwich Village to support her children. At the age of 50 she began painting and studied printmaking with Stanley William Hayter at Atelier 17. When she was 57, her work reached a critical turning point. She saw a show by Kurt Schwitters and the connection was immediate. Collage became her passion. 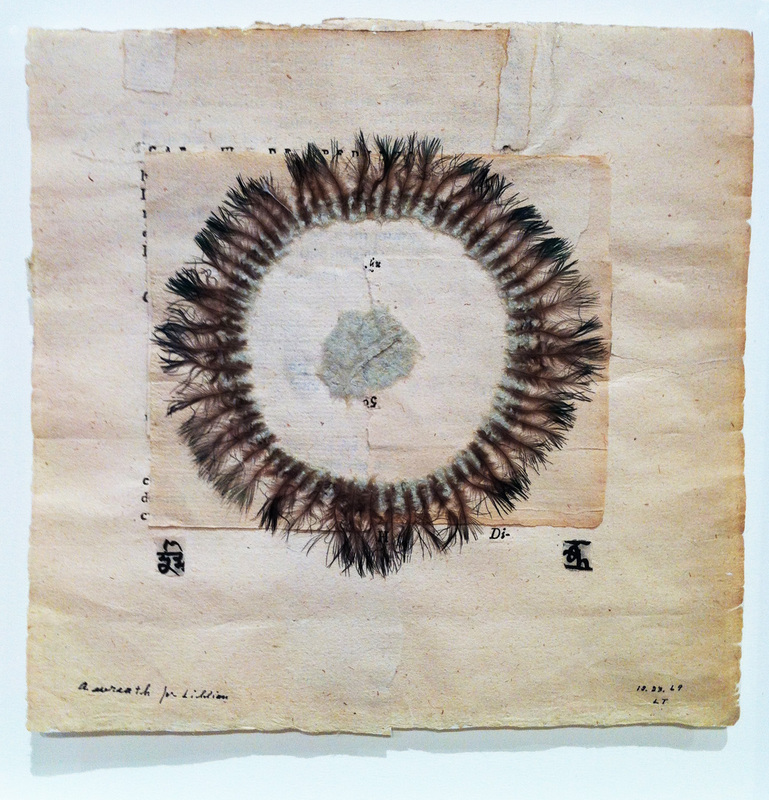 In the six years of life she had left before dying from a stroke, she produced over 400 collages. Unlike Ryan, Tawney lived a long life, passing away when she was 100. She had more of an opportunity to build her career and legacy, with exhibits in major museums and a number of monographs on her work currently available. *Note: I wrote about PST extensively in November and December of last year here on Slow Muse. A site search will pull up a slew of posts on the exhibits I was lucky enough to see.